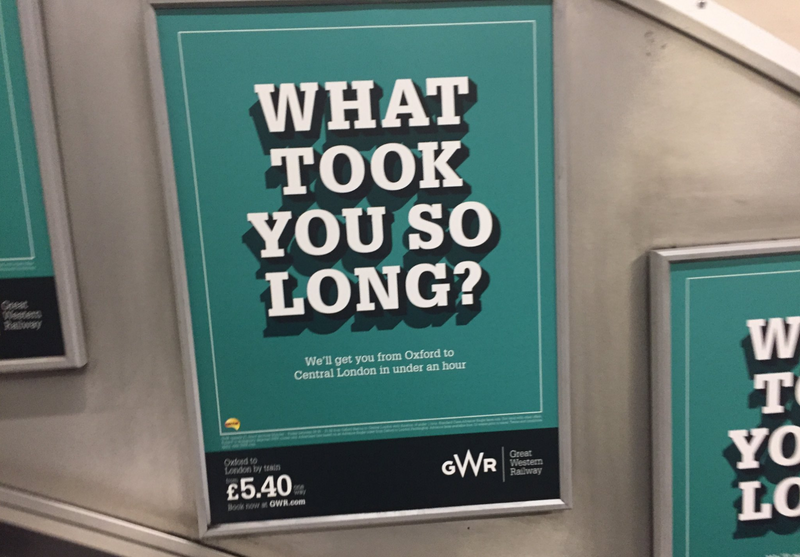 I recently saw a tweet from transport presenter/journalist Tim Dunn, showing images of GWR's latest ad campaign at Marylebone train station. Subjectively I like it (simple, good art direction) and I also think it works as a piece of advertising (has impact and is well targeted at incoming travellers on rival Chiltern Railways), yet the media purchase is probably the one thing that adds most equity to the work. 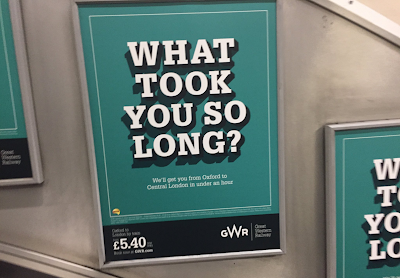 Although it's not uncommon for one advertiser to take every poster space both sides of the escalator at London stations, it's still a relatively rare exercise - one which no doubt can be put down to budget. It's an approach that can deliver great impact (depending on creative) especially when you consider the alternative. And that's your ad not being even noticed, let alone remembered, amongst the crowd of brands vying for attention as travellers battle motion sickness and a steep incline. Assuming each poster is selling something different, you could feasibly be exposed 50 different messages in the 30 seconds it takes to get you from top to bottom. And even if you looked at every single one, how many could you really remember? A classic case of getting lost in the crowd. And when you understand getting noticed is the biggest hurdle advertising has to overcome, you need every advantage you can get.